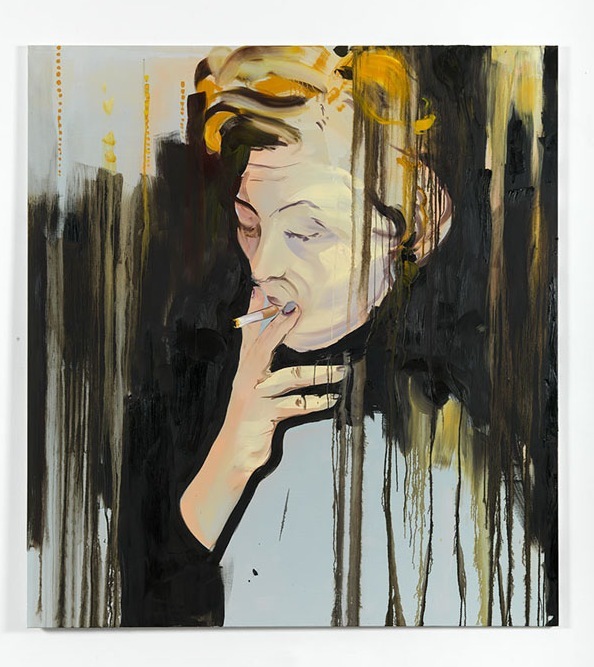 ‘Mother 200’ might sound like the name of an archetypal android character in an Isaac Asimov novel, but the painting that shares this title with Paulina Olowska’s latest exhibition, which shows a middle-aged woman puffing on a cigarette with squinting eyes, is far from a futuristic image. This old woman looks at a lower point towards her right, somewhere outside the canvas. She seems lost in thought, almost preoccupied, its troubled atmosphere strongly evoked by the unfinished aspect of the painting, covered in brown drips that traverse vertically the full length of the canvas. Olowska has painted this portrait with a remarkable economy of brushstrokes and this novel austerity is one of the most evident signs of the artist’s new pictorial direction. Another clear sign of said direction is the ubiquitous abstract backgrounds, as seen in many of the paintings in the show but particularly in ‘Mirrored and Pressed’, which shows a ghostly female figure trapped and obscured by a thick and texturised layer of abstraction in red, yellow and brown hues. This is quite a point of departure from previous paintings, from example the ‘Applied Fantastic’ series that she showed at Metro Pictures in late 2010. These were paintings heavily influenced by Polish fashion ads and spreads, flattened and precise in their figurative nature. They borrowed many traits and technical tricks from the realm of realist illustration and, with their blatant 80’s aesthetic, aptly embodied the retro fascination that underpins both Olowska’s individual work and her former collaborations with Glaswegian artist Lucy Mckenzie. Admittedly, the paintings in this show (all works oil on canvas and made in 2012) are still focused on female imagery and retain Olowska’s nostalgic and ironic gaze. The romanticizing aspect, however, seems completely gone. These paintings are rawer, and show less sympathy towards their subjects. Sometimes, especially in her depictions of old age like ‘Granny’, ‘Untitled (for Ulrike Ottinger)’ or ‘Mother 200’, they are even a little cruel. Who this ‘Mother 200’ might be is never revealed, though. Her countenance, name and demeanour evoke something matriarchal indeed. I squint in front of the equally squinting face and for a moment I believe I recognise Zofia Rydet, the late Polish photographer and collage artist whose surrealist and Modern Gothic aesthetics have been an enduring influence for Olowska. But the gallery assistant can’t confirm it, so my guess remains uncertain, nagging in the back of my head as I walk the gallery space. That Zofia Rydet comes to mind, however, is not mere coincidence. Downstairs I find a painting titled ‘Retro (for Alice Neel and Zofia Rydet)’, which shows a girl and dog. Their sphix-like poses remind me of Rydet’s ‘Landscapes’ collage while the expressionistic brushstrokes do resemble Alice Neel’s. What is shocking about this work, however, and also about the work in the opposite wall, ‘Gypsy Girl with a Child’, is their patterned backgrounds. Dark floral motifs cover both pictures, which have been painted in sombre palettes with metallic, almost graffiti-like accents. The result, compared with Olowska’s previous production, is puzzling, almost a naughty flirt with bad taste. Further camp inclinations are found upstairs, in the form of two flowery and rather impressionistic still-lifes titled ‘Pansy Bunch’ and ‘Silver Case’. I am not quite sure why I find these four paintings camp but I unequivocally do. Susan Sontag’s treatise on camp, however, sheds some light: “[…] Camp art is often decorative art, emphasizing texture, sensuous surface and style at the expense of content”, she wrote in 1964. I can’t help but thinking this might be a sort of mildly perverse game that Olowska has engaged in when producing these paintings, supressing a laugh in her studio while being completely absorbed in their execution. Amongst the still lifes, more female characters emerge. ‘Granny’ is a portrait of an old woman whose colours and textures are most hypnotising. The pattern of the woman’s dress and the pattern of the sofa she’s sitting on are a collision of blues, oranges, reds and yellows that is difficult to stop looking at. ‘L’introvertie’ picks up Olowska’s penchant for fashion themes, depicting a pensive young woman in fashionable 70’s clothes sitting in what looks like Parisian café. ‘The Rite’, an oval canvas in yellow undertones is an endlessly fascinating work. In what looks like a pencil-drawn, barely suggested scene, we see four girls in pagan dresses sitting on a forest, holding hands and engaging in ritual we are not privy to. Part an all-female version of a ‘Dejeneur sur l’herbe’, part a haxan gathering, ‘The Rite’ exudes a similar atmosphere to the Czech cult film ‘Valerie and Her Week of Wonders’ (1970), full of sexual innuendo, addressing that moment when young beauty and innocence meet the eroticism of the supernatural. Paulina Olowska ‘Granny’ (2012). Oil on canvas. In the end, what seems to emerge in this show is a female atlas of sorts, comprising clashing but complementary Western archetypes: the sophisticated Parisian girl, the tender Polish granny, the snobbish art collector, the young dreamer, the burn out intellectual… Olowska’s might have altered her painterly techniques, but the content remains the same: the multifaceted aspects of being a creative female, warts and all. In ‘Mother 200’ more than ever before in fact, it is the contradictions and imperfections that are most interesting and endearing. It is in this rejection of any idealism, I find, that women are best portrayed, and celebrated. Paulina Olowska’s ‘Mother 200’. Simon Lee Gallery, London, 13 April – 26 May 2012. Thanks for the tip, Maria! You’re welcome! Btw, nice blog.